My scientific writing has appeared in print in The Lancet, Geotimes, Mercator's World, Woods Hole Currents, the Newport News, Va., Daily Press, BioInform and the Lamont-Doherty Earth Observatory Alumni Association newsletter. I also write scripts for two syndicated radio programs, Our Ocean World and MicrobeWorld, produced by Finger Lakes Productions International. In 2010 I had the opportunity to fulfill a lifelong dream: to go to sea—really, really far out to sea—onboard a tall ship. The ship was the Sea Education Association brigantine, the SSV Corwith Cramer, and we were on the Plastics at SEA: North Atlantic Expedition 2010 to study plastic pollution in the North Atlantic Ocean. I was hired as science writer, photographer and editor, but I also pulled two watches a day just like everyone else on the ship. The Plastics at SEA blog consists of four main elements: a Daily Journal; Science Results; Reflections on Shipboard Life; and a statistical summary, "Today on the Corwith Cramer" that appeared on each day's Reflections page. Along with these elements were daily photo galleries and occasional videos prepared by expedition members Scott Elliott and Ben Schellpfeffer. To make it easier to find my writing and photography from the expedition, I've Storified it here. If you only want to look at the pictures, go here. We've accomplished a lot. 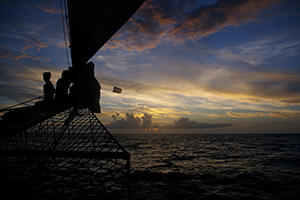 We've sailed more than 3,800 nautical miles. In the process we crossed over the Mid-Atlantic Ridge and nearly reached longitude 40°W. We've completed 128 neuston tows, 106 surface stations, 47 carousel casts, and 34 Tucker trawls. We've counted more than 48,000 pieces of plastic and 100 pieces of tar. We've collected 1,388 Halobates and 219 myctophids (lanternfish), and we've counted more than 5,000 copepods, 900 Cladocera, and more than 700 hyperiid amphipods – among other creatures. As with any good scientific expedition, the scientists face months, if not years, of data analysis and preparation of scientific reports. Some of their initial questions will be answered, but many more will arise out of what they find as they sift through the numbers. As for me, I'm obviously still working, so my statistics are incomplete. Through yesterday, I filed 33 daily reports (this is the 34th and final one). For those first 33 days, I wrote and filed 33,155 words – all the Daily Journal entries, all the cutlines for the photos, and six Reflections on Shipboard Life essays. I don't have statistics for how many times the engineering crew started and stopped the engine or generators. I don't have statistics for how many times we struck or set particular sails. I don't have statistics for how many times we gybed or changed course. Much of that information exists in the various logs the crew keeps, but it hasn't been compiled. Believe me, as I wrote those words, I was very, very tired. Glenn Yeffeth of BenBella Books contacted me sometime around 2006 to ask if I would consider contributing to a couple of book projects he was developing in his Smart Pop Books series that were to be edited by Kevin Grazier. Of course, I said, "Yes!" The first book was a compilation of essays on Frank Herbert's Dune. My entry, "The Shade of Uliet," (which can be downloaded here) evaluated the ecological principles explored in Herbert's seminal work. The other project Yeffeth asked me to contribute to was an exploration of the science presented in the works of Michael Crichton. I had been a fan of some of Crichton's other work—the Andromeda Strain being one of my favorite science fiction movies—so of course I said, "Yes!" again. I expected to enjoy the assignment. Unfortunately, my entry, "Be Afraid. Be Very Afraid," (which can be downloaded here) shredded the "science" presented by Crichton in his abominable screed, State of Fear. Because underwater videography is going to be an important method of reporting for my dissertation research, my Ph.D. committe at Virginia Commonwealth University wanted me to make a short film that: a) involved underwater videography; and b) told a story; that c) involved people and the usual residents of the underwater environment. This is what resulted from those marching orders. Determined to improve my skills at wildife filmmaking, in the spring of 2012 I enrolled in a non-credit course, "Classroom in the Wild: Chesapeake Bay," taught by Danny Ledonne and Lauren Demko through the Center for Environmental Filmmaking at American University. We spent several days at Blackwater National Wildlife Refuge on Maryland's Eastern Shore. This is the result. I began writing for The Lancet in 2002. To see the articles, you will have to register with The Lancet's Web site, but registration is free. This May 17, 2003, article reported on confirmation that SARS-associated coronavirus caused Severe Acute Respiratory Syndrome (SARS). I began writing for Finger Lakes Productions, producers of the radio programs MicrobeWorld and Our Ocean World, in 2002. Below are samples of some of my scripts from MicrobeWorld. You will need a media player, such as, QuickTime, Real Player, Winamp, or Windows Media Player to listen to the programs. This May 12, 2003, program described how microbial evidence is being used to learn more about the decline and fall of the Roman Empire. I began writing for Finger Lakes Productions, producers of the radio programs MicrobeWorld and Our Ocean World, in 2002. Below are samples of some of my scripts for Our Ocean World. You will need a media player, such as, QuickTime, Real Player, Winamp, or Windows Media Player to listen to the programs. Scientists' efforts to detect a quick sensor for saxitoxin, the cause of paralytic shellfish poisoning, was profiled in the February 13, 2003. Hurricanes are a significant hazard along the Atlantic and Gulf coasts. This February 11, 2003, program discusses how sediments deposited by past storms can be used to reveal the region's hurricane history. This January 8, 2003, program on Hudson Canyon mapping described a fantastic landscape on the ocean floor, near one of the biggest metropolitan areas on earth -- New York City. Students work on a master's project at Columbia. It's more of a long magazine piece for print and new media students, or a broadcast project for broadcast students. Of course I chose to work on a science topic -- on a controversy close to my heart. It probably could use an edit. I've spotted at least one error, but chose to post it as I filed it. Why can't we be friends: Or how does an observation based scientist get along in a theoretical world?